There is only one of you in this world, and that makes you pretty darn special. Even if you’re an identical twin, only one person in this world has your set of fingerprints and DNA. To put it simply, you are unique. Every man, woman and child in this whole wide world has their own distinct personality, and does things in their very own way. As adults, each of us relies on a set of different skill sets to perform jobs and tasks. We have acquired these skills through a lifetime of experience and learning. Even still, we have all developed differently, both intellectually and physically. Available by prescription only, the medication is also used to treat patients that have been diagnosed with Prader-Willi syndrome, or babies diagnosed with SGA (small for gestational age). Additionally, it’s prescribed for patients who suffer from a genetic condition called Turner Syndrome, or those who are diagnosed with idiopathic short stature. Patients with this disorder have been deemed shorter than nearly 90 percent of other similarly aged children. Doctors can also prescribe Genotropin to help combat the effects of severe and substantial weight loss in people diagnosed with Acquired Immune Deficiency Syndrome (AIDS). Other disorders that can be restrictive to Genotropin include patients with diabetes who suffer eye problems, patients diagnosed with cancer or those currently being treated for cancer, patients who are overweight with breathing problems, or patients who have had an allergic reaction to somatropin or any other ingredient found in Genotropin. Aside from the obvious benefits of physical growth, Genotropin HGH can increase bone density and strength, as well as increasing heart strength and kidney function. For this reason, athletes looking to increase their stamina and performance have reportedly abused the drug in some instances. Other benefits include lower cholesterol, a boost in the immune system, as well as improvements in emotional and sexual health. In cases of adult onset GHD, dosage will be weight based, or non-weight based. Patients receiving doses based on their weight will need an initial dose of 0.04mg/kg per week. Depending on tolerance, the dose can be upped to 0.08 mg/kg per week. Dosages will be adjusted at 4-8 week intervals. Non-weight based dosages will begin with 0.2 mg a day. Increases in dosage will occur every couple months. In both weight and non-weight based dosages, treatments are adjusted after measuring success and response to the hormone injection. Side effects from the drug can be wide-ranging and varied. Different disorders can cause a variety of side effects, but the most common effects can include, but are not limited to: swollen neck glands, voice changes, rash, sneezing, bowel problems, excess gas, throat soreness or dryness, congestion and breast pain. Additionally, side effects can include body aches, vaginal discharge, increased sweating, and trouble with swallowing. 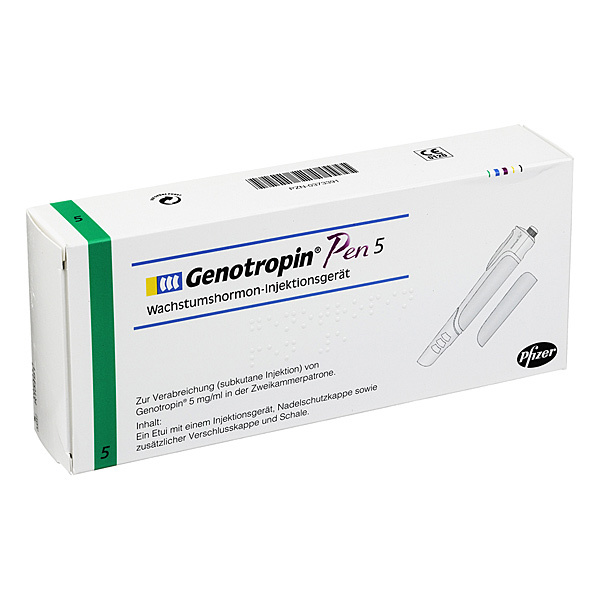 Genotrophin HGH retail average cost is $2.80 to $40.00 per IU of the hormone. Prices could be higher depending on delivery method and the difficulty of delivery.